Dr. Gaurav Agrawal, Paediatric Interventional Cardiologist at BLK Heart Centre is a trained expert in various interventional procedures. Prior to BLK Super Speciality Hospital, Dr. Agrawal was associated with Fortis Escorts Heart Institute, Delhi; Apollo Hospital, Hyderabad; Maharishi Valmiki Hospital, New Delhi and S. N. Medical College, Agra. An MBBS from LLRM Medical College, Meerut and MD (Paediatrics) from S. N. Medical College, Agra; Dr. Agrawal is a Fellow of National Board (FNB) from Apollo Hospital, Jubilee Hills, Hyderabad. 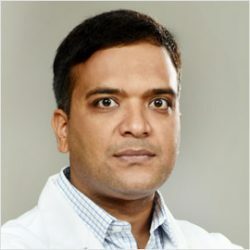 The areas in which Dr. Agrawal has specialisation include: Transthoracic Echocardiography including 3D, Transesophageal Echocardiography, Foetal Echocardiography, Diagnostic Cardiac Catheterization, Cardiac Catheter Interventions -Device Closure of Atrial Septal Defect (ASD), PDA, VSD, Balloon Dilatation of Pulmonary Valve, Aortic Valve, Coarctation of Aorta, Stenting of COA, Pulmonary Artery, Balloon Atrial Septostomy (BAS), to mention a few. BLK Heart Centre has a 25 bedded Paediatric Cardiac Surgical and Medical Unit, dedicated Paediatric Cardiac OT’s with several specialised programs: Arterial Switch Program; Foetal Cardiology Program; Neonatal Cardiac Surgery Program and Interventional & Device Program, making it one of the most specialised centres in North India.